Happily Ever Rushed: Skinnytaste- Mexican Carnita in the slow cooker! Grandma's birthday. Skinnytaste- Mexican Carnita in the slow cooker! Grandma's birthday. We just celebrated my Mothers birthday and I wanted to handle the menu, she watches our daughters when we work and does a fabulous job! I know I could never really repay her but when we have a chance to celebrate her I try to do my best. I had previously made the Carnita's for just my husband and I and they were fantastic so I knew this would be a hit. We all grew up in Arizona so my family just naturally loves Mexican Food, I wanted to make a few different items and Skinnytaste has so much to choose from. 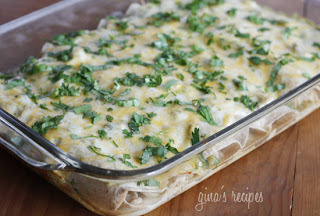 I had previously also made the Green chile enchiladas and knew those would also be a hit. My little sister jumped on board and also made Fried ice cream. This post will be full of great recipes. If I haven't said it before, I say it again. I love skinnytaste! You have to check out her website and I believe her cookbook is soon to be on the shelves. Season pork with salt and pepper. In a medium sauté pan on medium-high heat,brown pork on all sides for about 10 minutes. Remove from heat and allow to cool. Pour chicken broth in the crockpot, add bay leaves and chipotle peppers. Place pork in crock pot and cover. Cook low for 8 hours. After 8 hours, shred pork using two forks and combine well with the juices that accumulated at the bottom. Remove bay leaves and adjust salt and cumin (you will probably need to add more). Let it cook another 15-30 minutes. Next I made the green chile enchiladas. This recipe seems like it takes alot of time but the second time I made this it went alot quicker. I couldn't find fresh Jalapeno so I used jarred and it tasted just as good as fresh jalapeno. These are also so light and are just as delicious the second day. I am using skinnytaste pictures becasue I haven't yet mastered taking my own food pictures. In a medium pan, heat olive oil on low. Add onions, garlic and saute until soft, about 2-3 minutes. Add green chiles, beans, water, bullion, and cumin. Mix well and cover.Simmer on low 15 minutes. Remove cover, add chicken and cook an additional 5 minutes, or until it thickens and liquid boils down. Set aside. Spread about 1/4 cup of the enchilada sauce on the bottom of a 9x13" baking dish.Fill each tortilla with 1/3 cup of the chicken/white bean filling. Roll the tortillas and place seam side down in the prepared baking dish. Continue filling remainder of the tortillas. Pour the enchilada sauce over the top of the enchiladas. Top with cheese. Cover with aluminum and bake 20-30 minutes, until the enchiladas are hot and the cheese is melted. Remove from oven and top with fresh cilantro or scallions. I will have to find the recipe my little sister used for the fried ice cream, it was delicious. We had such a nice time and I loved being able to cook for my family. My daughters are hugged and loved on every minute of the day and I know there is no better place for them when we are working. I never could have imagined what it was like to see my mom with my daughters. They have such a deep and loving relationship, my two year old wouldn't know what to do without her grammy and I know that Hayden will feel the same way. I always wonder if she knows how much we appreciate her and how much she means to me. I will forever be grateful to my mommy for everything she does for all of us.